he is given more opportunity. With Patrik Laine on the injured reserve, now is the time to give Petan a larger role again. guess Mark Scheifele, Bryan Little, Blake Wheeler, Mathieu Perreault. shooting at 3.7%. When you look at the fact that last season’s shooting percentage was 8.96%, you have to expect Petan’s shooting percentage to improve. Which should point to more production with more opportunity. As well, as a first year pro, Petan was scoring at a .68 points per game pace in 47 AHL games, which is pretty good. Petan’s skills are translating to the pro game. If you take a look at the shot chart below, you will notice that Petan is taking most of his shots from right in front of the net. This is a very good sign for Petan and his development because the goals will eventually come, if he continues to consistently take shots from right around the net. These two combinations excelled at shot attempts when on the ice. The PWC line had a Corsi For percentage (CF%) of 59.72% in 5v5 minutes as well as a Fenwick For percentage (FF%) of 66.07%. 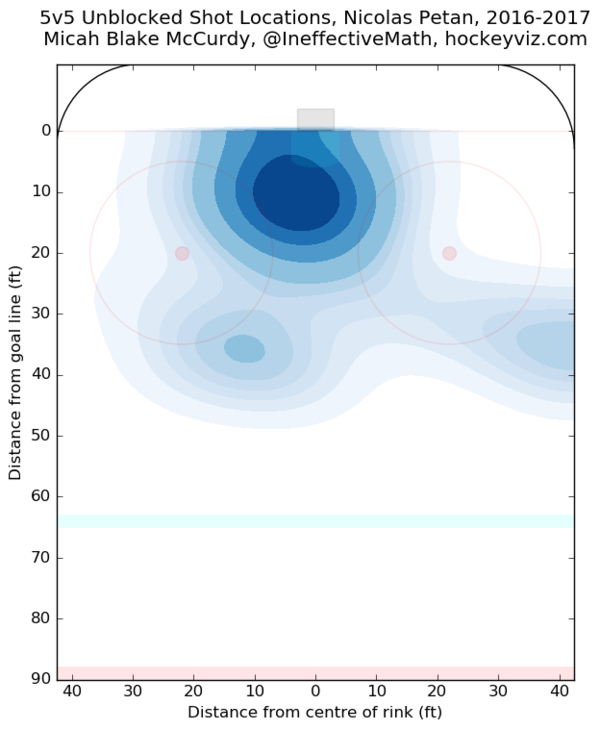 The PWD line had a CF% of 69.39% and a FF% of 66.67%. Now, remember these are small samples of ice time and as a result, we cannot come to concrete conclusions with them. However, they do point to the fact that Petan could provide the Jets with more scoring and better play overall, with an increase in ice time. With Laine on the injured reserve, there’s no better time to see if Petan can make up for some of Laine’s production. Petan has typically been more of a playmaker and if he is given better line mates, then the points should start to come. What could be a first step in increasing Petan’s ice time, is playing him more on the powerplay. He currently averages around 2.23 minutes of powerplay time. Petan is currently averaging just over 13 minutes of total ice time per game, so adding a little bit more of powerplay time shouldn’t hurt his play. Petan has not let his 5′ 9″ frame stop him from going to the “gritty” areas to try to score. With time, he will continue to adapt to the NHL and bring a greater scoring touch to his game. I’m a huge Nic Petan fan and want the Jets to keep him and play as much as possible! If, as Jets management have said, this is an evaluation year then it would seem to be rather self evident that Petan should be playing higher up the roster. Both for development purposes and evaluation. Even if the idea is to win games it seems obvious that Petan should switch out Drew Stafford in the top six. Stafford may score a few but his “fly by” defensive efforts seem to cost the team more goals than he scores. It makes me wonder about Paul Maurice that he thought Burmi was the real deal and gave him every chance to succeed but he can’t seem to wrap his head around the obvious talent of Petan. Not to mention PoMo’s affection for a liability like Stafford who Maurice is playing over Petan to the determent of the team and its future. Please Chevy, hire a real coach.